The Finals match of the Invitation Cup 2013 between Loyola High School Margao and St. Britto’s High School Mapusa began by the Chief Guest, Col. Melville D’souza, arriving at 4 PM. The Chief Guest personally met the two Finalist teams and then hoisted the Royceton Gomes Memorial Sports flag. The flag was then lowered to half-mast by Mr. Joe Gomes in memory of his son Royceton Gomes. The game kicked-off at 4:30 PM. St. Britto’s began with a great offensive against Loyola’s. There were many tense moments with each team attempting to score against the other, but neither team could convert any goals. The first half completed in a draw 0 – 0. In the second half St. Britto’s stepped up the pace even more and kept the Loyola goal-keeper busy with sharp shot attempts. However, against the run of play, Loyola scored a clever goal through Johan Gracias in the 40th minute. Taking advantage of the lead and stepping up their game, Samward Pereira of Loyola’s scored a great goal in the 53rd minute tackling three defenders and the goal-keeper. 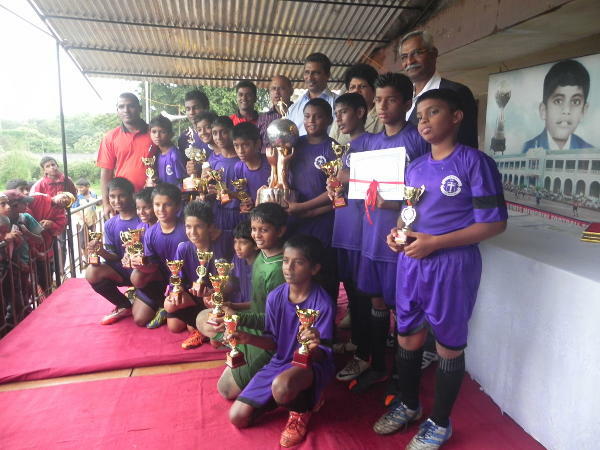 Loyola’s High School Margao won the Finals match 2 – 0. The Cheif Guest said a few words after the match and presented the Runners-up and Winners trophies to the young footballers from Goa. It was an exciting and fantastic finish to the Invitation Cup 2013 at Belgaum.